It is a co-education school from Montessori to Class V. New admissions are made in the beginning of the academic session. The admission procedure starts at the end of January. Parents can get the details of admission procedure from the office. In the month of March entrance tests and interviews are held. The entry point for admission in APS Garrison Junior Lahore Cantt is Play Group which is based on interview of the child as well as his / her Parents. For other classes, admission is finalized in the light of the suitability test of English, Urdu and Maths. Level of the test is that of the previous, class for admission in the new session. For the students seeking admission at a later stage, test is based upon the syllabus covered in that class. A preferable 70:30 ratio of admission of Army/Civil personnel is maintained. Admissions are offered to students from other institutions to fill existing vacancies. These are granted on merit, based on the candidate’s performance in admission test held by the LGES Secretariat. Those finally selected for admission are required to join the respective branches of the LGES. 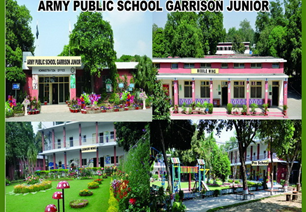 Any candidate desirous of seeking admission in APS Garrison Junior has to obtain the prospectus inclusive of the admission form APS Garrison Junior Lahore Cantt school office. Admission test details will be given according to class for which admission is required. It will be taken in three subjects (English, Urdu and Maths) till class IV, whereas in Class V, Science is also included. · The Medium of Instruction is English for all the classes. · Since APS Garrison Junior is the feeder branch for APS&C for Girls (Azam Garrison) and Garrison Boys’ High School& Intermediate College, the course of study is designed to suit the need of the students in secondary education as well i.e the demands of changing times. Two terms are allocated in an academic calendar from April to October and November to March. The students from Play Group to Class V follow the scheme of studies designed and approved by Army Public Schools and Colleges System(APSACS) Secretariat, uniformly throughout Pakistan.